Good Cook Doris: Health Snack Wednesdays: Snacks that Pop! This week is full of snacking opportunities – snow days, Healthy Snack Wednesday, and the Superbowl! Part of the reason we started this series is that snacking can get boring. So this week’s post is dedicated to snacks that pop! First, congratulations to the winner of two vouchers for Veggie Patch Products! The winner, as selected by Random.org is Jordi, who said” my favorite veggie is cucumbers or celery. i like to eat them raw with some italian dressing (on the cucumbers)”. I’ll be in touch to get your mailing address and the vouchers will be sent your way! To celebrate this week’s popped up recipes, popchips™ has generously donated two one-month supplies of popchips! Two readers will each win one box full of popchips to snack (see if they last the month!). If you haven’t heard of popchips, they are popped potato snacks. Think potato chip crunchy without the greasiness of a regular chip or the cardboard taste of baked potato chips. They are made for snacking – and one bag of original flavor will set you back just 120 calories and 4 grams of fat (more nutrition info here). If you are a potato chip lover, than popchips are a healthier option to satisfy your craving. They even have a Snacker’s Credo! Quick disclosure: popchips sent over a sampler pack of chips to use in this week’s healthy snack recipes and two boxes of chips for the giveaway. I was not obligated to use or review the products and I was not compensated financially. All opinions belong to me. Now on the fun! This week I have two popping recipes for you to try out. I am admittedly not a potato chip lover – I usually go for tortilla chips if I have a chip choice. 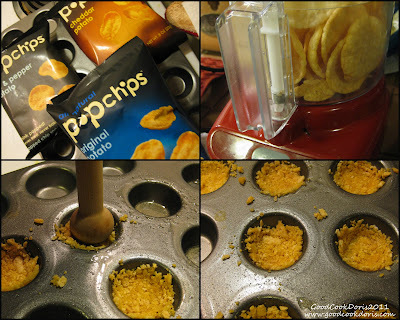 I wanted to come up with a creative way to use popchips in a healthy snack good for weekdays or maybe a Superbowl party. We’ve already made dips a few times and that really isn’t incorporating the popchips. I thought about potato chip cookies (saw them on a few blogs), but every recipe involved a lot of butter or shortening. 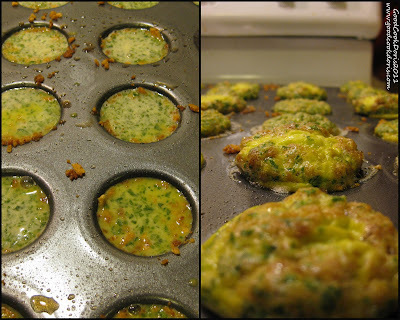 After thinking about it for a few days, I decided on making mini-quiches with popchip crusts. It is similar to last week’s snack, but this is more party ready! You can pick your own combination of flavors for the crust, but I chose to mix original, salt and pepper, and cheddar for flavor that popped. I didn’t use any cookbooks or recipes for this, so while it could use some tweaking I had blast putting it together! This is a fairly quick dish to put together. It can be served hot or cold and you could make them the day before and keep them in the refrigerator until party time. Just reheat before serving. To have a crispier crust, make sure to coat the entire mini-muffin tin with the popchip mixture and only fill to the top of the crust (I got a little excited and overfilled mine). Only a few came out with crispy crusts due to the extra filling, but they tasted like little egg & hashbrown bites. I didn’t add any extra seasoning, because of the flavors in the popchips. Serve with a dash of hot sauce, if desired! For my second snack, I popped up one of my favorite treats, popcorn! During the last snow day I played popcorn roulette, mixing up three different flavors and then spinning the bowls around. One bite could be lavender, the next za’atar, and the last green chili. 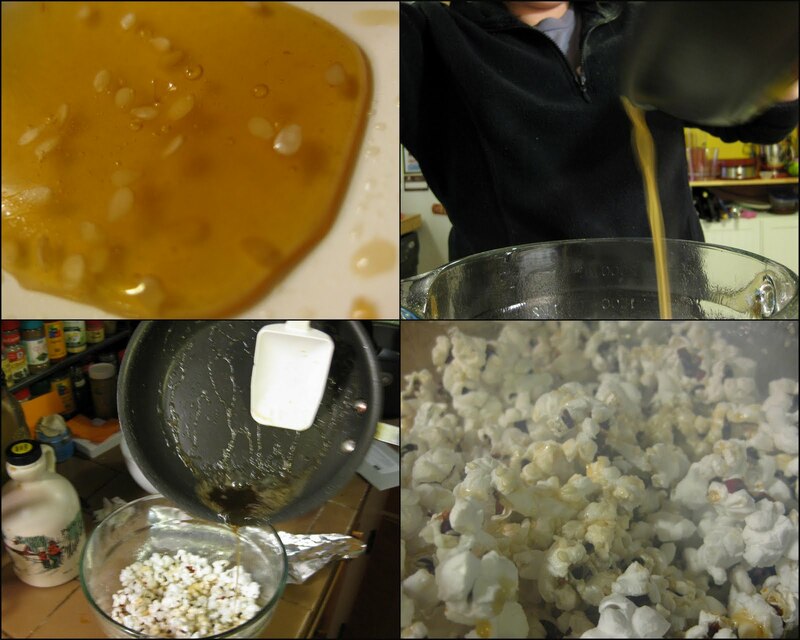 I have an Cusinart Crazy popper and can control the amount of oil I use when I pop – and be sure that my popcorn isn’t loaded with oil, butter, and other funny chemicals. I wanted to make a sweet popcorn for this week. The hubby loves kettle corn and caramel corn, but the store bought versions are loaded with fat and sugar. I popped up a batch of red popcorn kernels from the farmers market and made a quick glaze to add on top. After the popcorn glaze dried, I packaged it into sandwich bags in appropriate serving sizes. It’s great to throw in your bag for the car, an afternoon snack, or a something to tide you over until dinner. Try not to eat it all while putting into bags. There will be two winners for the giveaway. Each winner will receive a box containing a one-month supply of popchips! I didn't count the bags, but you will be snacking for a while! There are a few ways to enter this week, please leave a separate comment on the blog for each action. You can do any or all of them for a chance to win! Like popchips on Facebook and leave a comment on their wall saying "@GoodCookDoris sent me! Thanks for the giveaway!". Come back and leave a comment below telling me you did so. Follow @popchips and/or @popchipsboston on Twitter and tweet, Just entered to win 1 month of @popchips from @goodcookdoris, you can too at http://bit.ly/f414b5. Leave another comment below. Leave a comment below letting me know your all-time favorite snack food, no healthy answers needed. Follow @GoodCookDoris on twitter or Like Good Cook Doris on Facebook (leave a note saying hi! ), and come back and comment that you did. Entries accepted through Tuesday, February 8. Winner to be announced on Wednesday, February 9. For an extra entry, head over to Renee's blog at Eat.Live.Blog. and be sure to check out her snacks that pop! ok my current favorite snack food is gummy strawberries, no idea why but I am obsessed! I already like @popchipsboston on twitter! and i already twitter follow you. Rock. My all time favorite snack food is trail mix, with chocolate. I think I like the salty and sweet combo! As for the Popchips, my husband is totally addicted. I have to hide them from him and portion it out, or he will eat the whole bag in one sitting! I love snacking on nuts! I like all kinds. also did all the other entries. good luck everyone! What a creative way to use Popchips! I liked them on Facebook and left them a comment! I follow @Popchips on Twitter and tweeted! My all-time favorite snack food is kettle corn popcorn! I don't think I have an all-time favorite snack food, but I REALLY love crunchy things, like PopChips, and regular chips too! My favorite snack food is Taste of Heaven chocolate drizzled caramel corn-it's teh best! That maple-sesame popcorn looks very tasty!! I just saw Popchips at the grocery store for the first time today! popchips cheddar when being good. But to be bad, I love cheddar cheese & onion hot dip with ritz crackers! I can't wait to try to the pop chop recipe. PS, love the recipe you created...I bet it was awesome! I absolutely love Fritoes and Heluvagood French onion dip! i liked popchips on facebook and left a comment saying you sent me! i follow popchips and popchips boston on twitter! I love this quiche idea! I follow you! My favorite snack is either wasabi almonds or dark chocolate! I also liked your FB page and said hello. And, my favorite snack food is... popchips! I love them. Can't get any better than fat-free, guilt-free snacking. The salt & pepper flavor is so good. I posted on facebook to win the popchips!! YUMMY!! I already like you on FB, and I can't quite bring myself to like something I've never tried, but these pop chips intrigue me, and I LOVE me a mini quiche! So here I go. Love your sight and i love popchips!! I like popchips on fb! My favorite snack is chips and dip...nowadays it's reduced fat chips and fat free dip! i liked you on facebook. Looks like a sight i will like to follow! My favorite snack food would have to be CARROTS! I am so lame. However, I did down an entire bag of popchips w/ my boyfriend while watching the superbowl on Sunday...they are SO addicting! Just left a message on your FB page ... thanks! FAvorite snack food...popcorn and m&ms combined. Preferably in the movie theater!! My all-time favorite snack is hummus and pita. Soul food! I can't wait to try the quiches! My favorite snack food is anything with a crunch! My favorite snacking food is nuts especially Cashews. Even if I don't win anything, I'm so glad I found your blog. Amazing recipes and GO SOX!! My all-time favorite snack food is pistachios. I always have to cut myself off lol.